Are your students content creators? Students can use their reading and research experiences to create a shareable website. If you’re looking for tips for biography projects, you’ll definitely want to check out the fabulous and free Spark Page website creation tool. I’m a huge fan of customizable, open-ended creation tools and Spark Page is perfect for classrooms. Although it is a popular tool for freelancers and small businesses, Spark Page is also embraced by the education community. Spark Page lets users create professional websites. Anyone can combine text, images, links, and a variety of content on a single page. In classroom settings, it can be used to publish student work to share with the world! As an education consultant and former classroom teacher, I have the opportunity to spend time side-by-side with teachers and students in classrooms throughout the country. This year I worked with a Social Studies teacher who was exploring the Civil War with her students. Her students were able to take what they learned about notable figures during this era and create Spark Page biography websites. 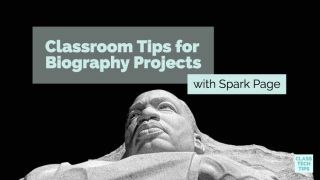 As students spotlight notable figures in any subject area, they can create websites with Spark Page. From Clara Barton to Harriet Tubman during an exploration of the Civil War, to spotlights on innovative entrepreneurs like Joyce Chen or Coco Chanel, students can create biographies with Spark Page! A biography project isn’t just about celebrating the life and achievement of a notable person. This type of writing experience can be rooted in instructional goals. This could include goals related to informational reading and writing in response to research. If you’re looking for students to synthesize information gathered from multiple sources and make connections to cross-curricular content goals, a biography project is an excellent choice! A checklist can help focus students on the task at hand and address your instructional goals. For example, a checklist might connect to a mini-lesson you taught on identifying primary source documents. If you want your students to include links to primary source documents on their Spark Page website you’ll want to make sure you dedicated time in class to explore online resources. Bottom line: Expectations on a checklist should match content your students have spent time interacting with in class. Creating an exemplar for a project is a great way to demonstrate expectations for students. It’s also an opportunity to become familiar with the platform students are using to create their biography website. Once you log in to Spark Page, you can add a title and image to the header as well as the content for your website. You might decide to have students compose their biography projects in a collaborative document first so you can offer feedback before they publish their Spark Page. I share a few strategies for this type of workflow in this blog post. One of the reasons I love sharing Spark Page with teachers is the built-in citation feature. When students search for images to add to their Page, the tool will automatically create citations. The citations will then appear at the bottom of the page. What if your students collect resources from other places? Well, Spark Page lets you edit the citations and add your own. So if you expect your students to cite sources in a particular format (like APA or MLA), they can edit the citations to fit this expectation. When students finish their Spark Page biography project, it’s easy to share their creation with the world. The Share button at the top of the page lets students create a unique link to their website. You might have students share this link with friends and family. Alternatively, they can post the link in a class discussion forum for feedback from their peers. If your students are creating websites on one topic like “space pioneers” you might want to locate an organization related to this topic. This organization can serve as an authentic audience for their work. They have an invested interest in the subject your students have researched and published on during this project. Have you created websites with Spark Page? Do you have any biography project tips to share? Use the Comments box below this post to contribute to the discussion. Monica Burns is a former classroom teacher, author, speaker, and curriculum & edtech consultant. Visit her site ClassTechTips.com for more ideas on how to become a tech-savvy teacher.